Joan of Arc was born on January 6, 1412 in the village of Domrémy, located in the valley of the Meuse, East France. Joan’s father was Jacques D’Arc a well to do but illiterate, peasant farmer. Her mother was Isabelle Romee. Joan’s parents owned about 50 acres of land and her father supplemented his farming work with a minor position as a village official, collecting taxes and heading the local watch. Like her father, Joan never learned to read or write. 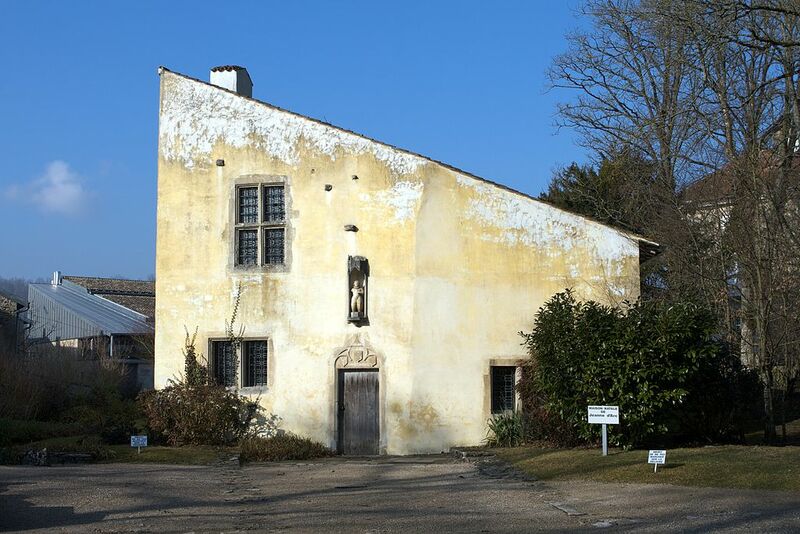 Joan’s birthplace in Domrémy has been preserved for over six hundred years and is now a museum. Before she responded to her call, Joan worked in harvest fields and guarded the animals at pasture. Skilled in sewing and spinning, Joan had woven wreaths for a statue of Mary. She would have ate bread, made from barley, rye or beanflour, soaked in inferior wine. Joan of Arc was a highly competent cook. According to a contemporary report, Joan was “A young woman of robust flesh and healthy looking”. 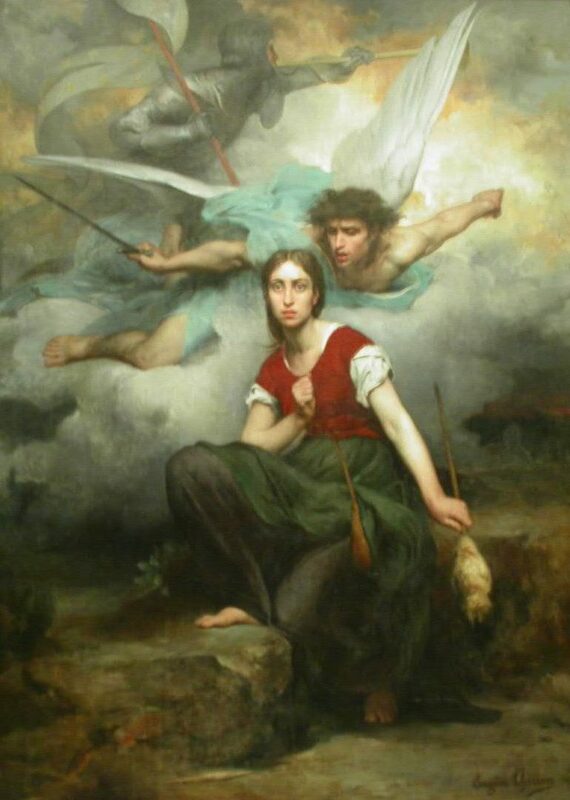 A good pious girl who took Communion monthly, Joan of Arc started hearing the voices of Saints Michael, Margaret and Catherine in her father’s garden in 1425 when she was 13. They told her that it was God’s will that the English should be thrown out of France. Three years later, Joan of Arc was taken by her Cousin Durand Laxat to Count Robert de Baudricourt. She convinced the originally dubious Count to take her to the Dauphin Charles, who had been deprived of his rights as heir to the French throne by the Treaty of Troyes eight years earlier. After a searching examination by churchmen, the teenager persuades the uncrowned King Charles VII that she had a divine mission to expel the English from France, to anoint him with holy oil and secure his coronation. Within a few months of persuading the Dauphin Charles of her callings, Joan of Arc was leading a spiritually revived army into war, which had renounced swearing and prostitutes. The city of Orleans on the River Loire was the northernmost city that remained loyal to the French, The English began laying siege to it on October 12, 1428 and appeared to be winning until the entry of Joan of Arc. She initiated several attacks gaining victory on May 8, 1429 by taking the southern approach to the bridge, nine days after her arrival. Joan of Arc subsequently defeated the English at Patay and persuaded Charles VII to be crowned King of France at Rheims. Before Joan helped restore the Dauphin Charles’ fortunes. He had sold his last jewels, was forced to have sleeves patched onto his old doulet, could not afford new shoes and only had four crowns in his purse. At his coronation after defeating the English at Patay, Joan was given the place of honor beside the King. A companion-in-arms of Joan in the French arm was the infamous Captain Gilles de Rais. He was later convicted for torturing and killing over 200 children at the urging of the devil. De Rais is believed to be the inspiration for the 1697 fairy tale Bluebeard (Barbebleu) by Charles Perrault. The slightly built teenager unattractively wore her hair short to blend in with the male soldiers. The Maid of Orleans wore men’s clothes when mixing with the male soldiers to protect her modesty. She was clad in white armor when fighting and carried a white banner that represented God’s blessing. Joan had surprisingly racy humor. She apparently used the word “goddam” frequently as a sarcastic reference to the English soldiers favorite oath. 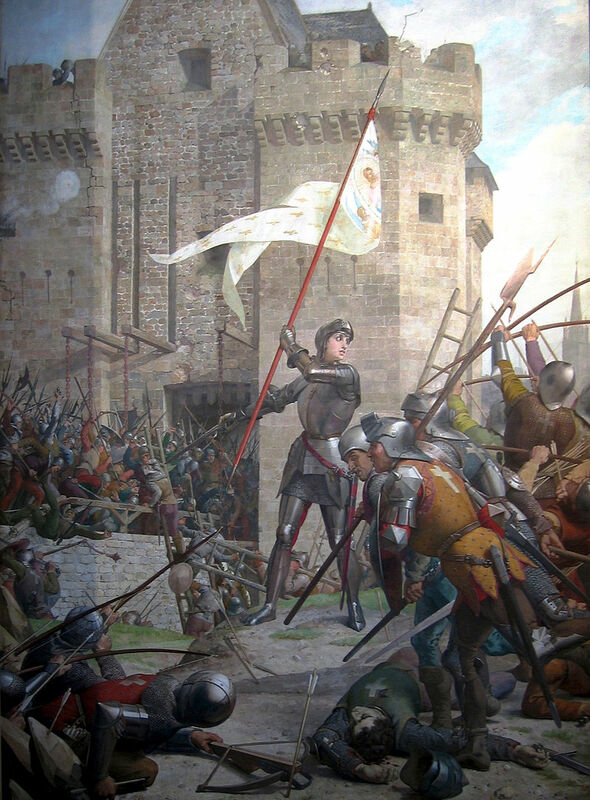 Having failed to capture Paris and seeing the French were not pressing home their advantage, Joan of Arc went off to relieve Compiègne in 1430. Her success had made her enemies amongst the Burgundians, English and church officials. She fell into the English hands, via the Burgundians (who delivered her for ten thousand French Francs). 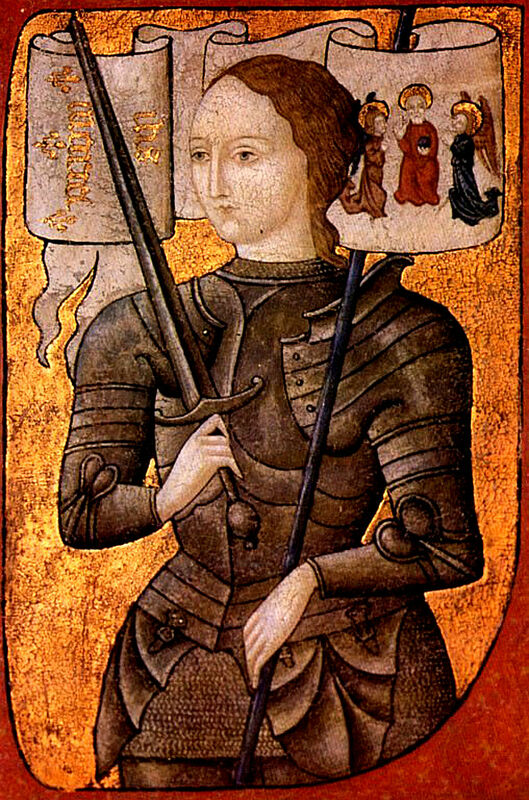 Joan of Arc was imprisoned for nine months before being bought before the Court of the Bishop of Beavais in 1431. In fifteen sessions she defended herself, standing up to the charges with good nature, majoring on her devotion to her country and her purity. She was charged, found guilty of witchcraft and heresy and originally sentenced to life imprisonment. However Joan was forced to continue to wear male apparel, (because that was all she was given). This strengthened the prosecution’s case, and she was condemned by the pro-English judge, Pierre Cauchon. to be burnt at the stake as a heretic and a cross-dresser. 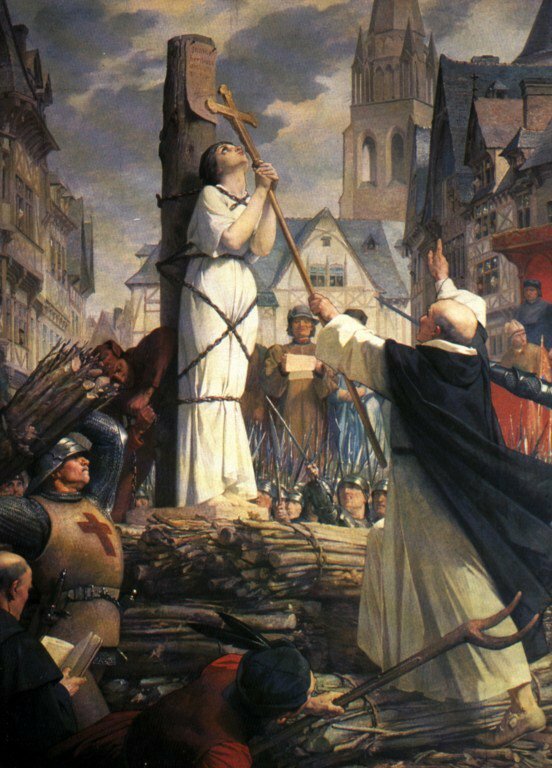 The execution of Joan of Arc by burning took place in Rouen, France on May 30, 1431. The peasant teenager asked for a cross to be held in front of her that she could see through the flames. Joan’s last words were ” Jesus! Jesus! Jesus! Blessed be God.” As she died, the spectators, including the soldiers, wept. After Joan’s clothes had burnt away her naked, charred body were shown to the public to show she wasn’t immortal. Her ashes are thrown into the River Seine. By burning Joan, the English alienated the French public opinion and soon treaties were being made with the Burgundians. Within 20 years England had lost all of France, bar Calais. “They should not have burnt her but they did, ” wrote a promising young author called Jane Austen in her The History of England. After she was burned at the stake, Joan of Arc’s brothers hired an imposter so they could collect on her good name fraudulently. King Charles VII of France appointed three Bishops to hear the evidence of Joan of Arc’s case and the defense, including Joan’s family, were allowed to produce new material. The court annulled the previous verdict on July 7, 1456 and condemned an atrocious miscarriage of justice. Joan of Arc asked King Charles VII to exempt her home village of Domrémy from taxes “forever.” This was upheld for over 300 years until the French Revolution happened and the promise was forgotten. There is more contemporary material on Joan) than any other medieval figure, mainly from records of her trial. In 1921 Pierre Champion published a text of the actual trial. Centuries later, her iconic hairstyle was the inspiration for the ‘bob’ – a haircut that became all the rage in the Roaring Twenties. Joan of Arc was beatified in Rome on April 18, 1909 and canonized in 1920, for her faithfulness for promoting to God’s grace. Jeanne d’Arc, by Eugène Thirion (1876). Saint Joan of Arc’s feast day is 30th May. She is the only Catholic saint to have been burnt as a heretic.